Homework time doesn’t have to be a pain! This Homework Station Turntable keeps all homework supplies at your fingertips! Now that the boys have been in school for awhile and a routine has been established, alright, a loose routine has been established, I’m able to see the areas that need improvement. One of them is the storage of homework supplies. Bryce and Reece (Bryce in particular) are at that age where they don’t just need a pencil and calculator to do homework. No. They need crayons, colored pencils, scissors, glue, tape, etc. And having them call on me for each and every one of their needs was getting to be tiresome. Don’t get me wrong – I really do love helping them. It’s just that taking out and putting up all of the supplies was just a little too much for me…and for them. Naturally, I came up with a solution that works for all three of us – this fabulous homework station turntable! The great thing is how much use this turntable is getting. 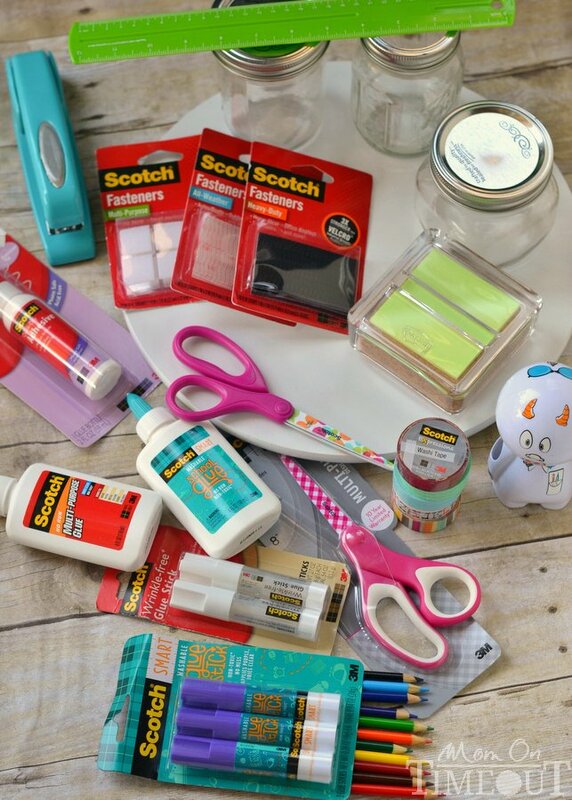 The boys aren’t just using it for homework, they use it when they’re working on art, making books, and for simple things where they just need a pair of scissors, or a piece of tape. It’s been awesome having a single location for all their supplies and I have to say, they love how it spins! 1. Gather the necessary materials for the project and clean the surface of the rotating turntable and bottoms of each mason jar. Make sure everything is dry before getting started. 2. Use a ruler to measure six, triangular sections and mark with a pencil. You want them all to be the same size. 3. 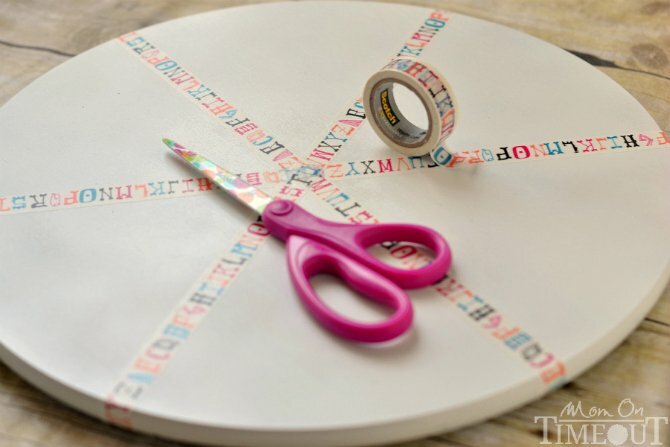 Following the lines as a guide, adhere washi tape in the pattern or color of your choice to divide the sections. Cut the end of the tape for a cleaner look. You can use different washi tapes for each section but I thought it looked a little nicer using the same one. 4. Plan the layout of the jars, by placing one jar towards the edge of each triangular section, until you settle on the placement. I used three larger jars, three smaller jars, and one large plastic container in the center. 5. 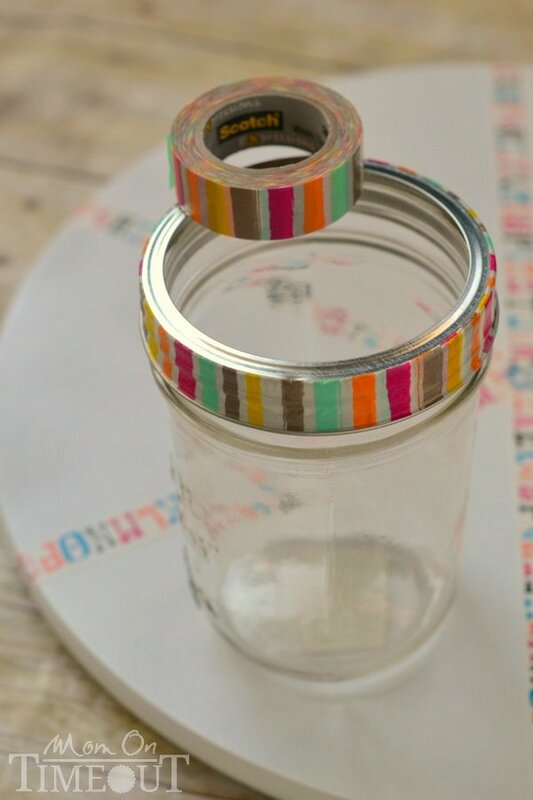 To decorate the first mason jar, first remove the lid by twisting off the metal band on the jar until it is loose enough to slide off. Then, remove both the band and the lid from jar. Discard the lid. 6. Decorate the band by applying washi tape in the pattern or color of your choice all the way around the exterior of the band, smoothing with your finger as you go along. Cut the tape (instead of overlapping it) for a clean look. I used blurred lines, cracked, pink quatrefoil, big zig, alphabet and feather patterns on the bands. I love having all the different patterns and colors! 7. 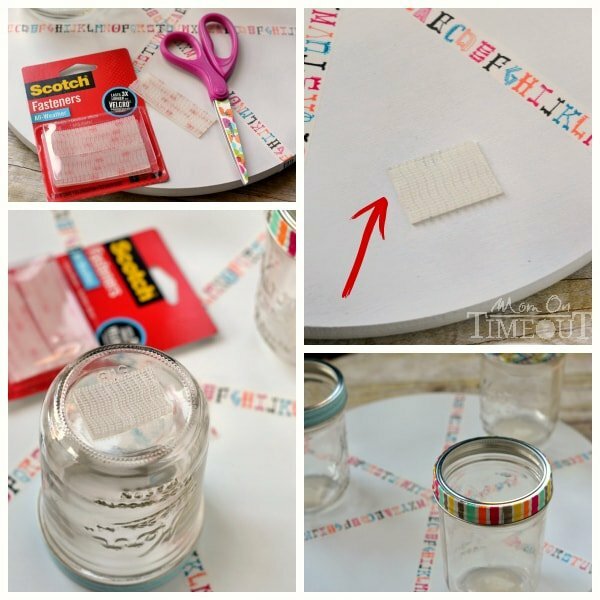 Repeat steps 5-6 to decorate the remaining mason jars. 8. 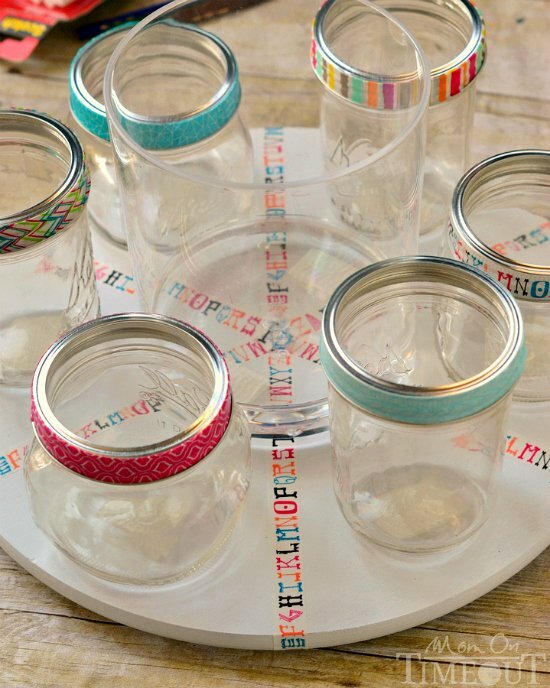 To secure the jars in place, first cut the Scotch® All-Weather Fasteners in half – to fit the bottom of the mason jar. 9. Remove liner on one side of the fastener and apply to the bottom of the mason jar and press firmly. 10. Remove liner on the second side of the fastener and apply to the surface of the rotating turntable where you want to place the jar. NOTE: Each inch of product holds up to two pounds. 11. Align the fasteners and attach the jar to rotating turntable by pressing firmly together until you hear a snap, indicating closure. You’ll know when it’s secure! 12. Repeat steps 8-10 to attach the remaining mason jars to each section, and the cylindrical plastic container to the center of the rotating turntable I used two sets of fasteners to attach the center plastic container to the turntable. 13. Now for the fun part! 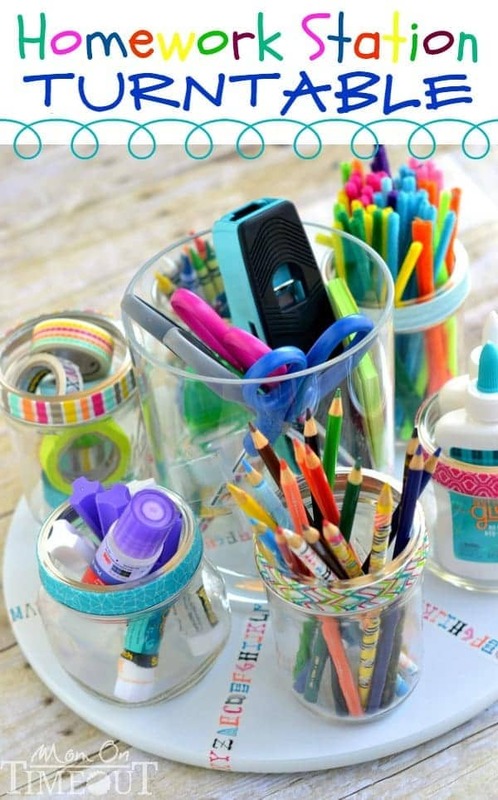 Fill the cylindrical container and mason jars with homework supplies, and place in your homework area to keep supplies organized and accessible. Disclosure: I have been selected to be a brand ambassador for Scotch Brands. I have been compensated for my time. All opinions expressed are 100% my own! Hi Trish! I love this idea of yours! Thank you for sharing your ideas with us. Hi Trish! I recently featured this beautiful project on my blog. And I am definitely replicating it. It’s absolutely practical and stylish. My kind of organization. Thank you for sharing your creativity! Where did you get the turntable and what size is it? I got mine at IKEA Destiny and I just measured, it’s a little over 14″ in diameter. Hope that helps! I also would like to know where your supplies came from. For some reason, I am unable to see a reply to that question. Particularly that awesome turntable. Thanks! Such a great idea! I am just curious as to why you chose to Velcro everything down – did you find things jostled and slid too much without it? 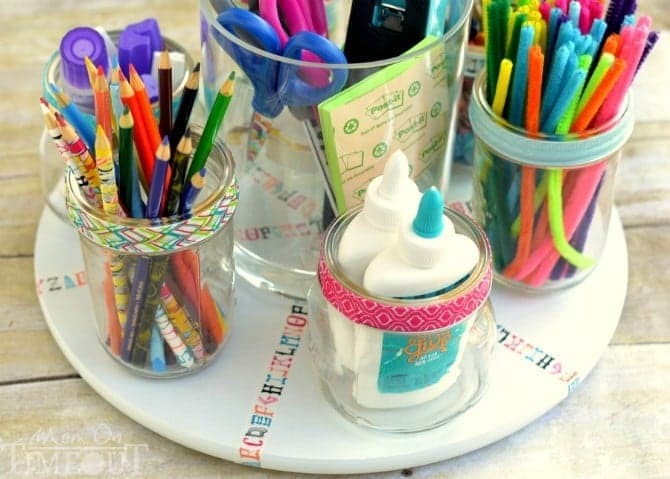 Do your kids take them off and on to use the supplies or just slide the whole shebang over? The velcro gives them a place to put the jars back and yes, they take them off and put them on every day. 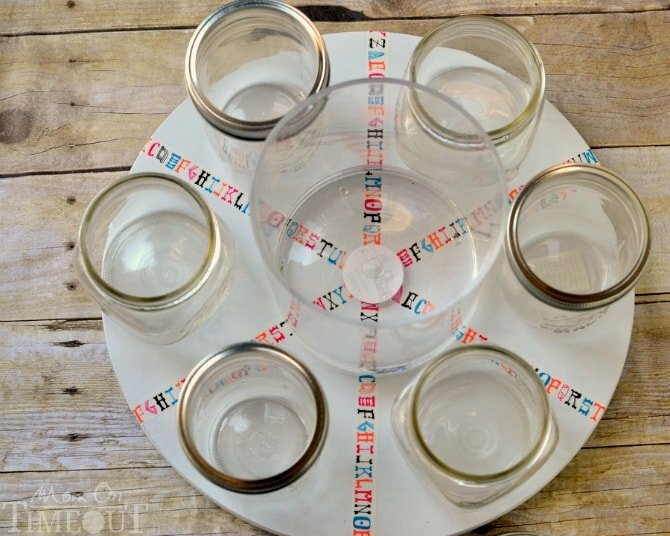 Because the table spins, the jars would just fly off otherwise. Would you mind sharing where you found all your supplies, particularly the turntable? Thanks! Thanks Nancy! It has helped tremendously! I want you to know, I really enjoy your website. Except for one very annoying thing. I HATE Facebook, I will never ever and ever follow anyone on Facebook again. When I visit your website on my phone I keep getting a popup about following you. I’m unable to get rid of it, after a minute I leave, because I can no longer stand that annoying popup……. I appreciate your feedback Mickette. I know exactly what you are talking about. I haven’t had an issue closing out the popup but can understand that it might be difficult on some devices. I have turned off the popup for the time being. Thanks again!